Another puzzle piece in the Star Wars universe falls into place with this action-packed prequel to Hugo-winner Zahn's Star Wars: Survivor's Quest (2004). Familiar characters such as Obi-Wan Kenobi, young Anakin Skywalker and the evil Lord Palpatine (aka Darth Sidious) make appearances, but the true star is Commander Thrawn, a red-eyed, blue-skinned alien. 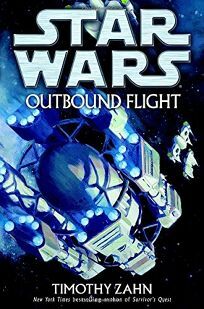 On the Outbound Flight, a mammoth Jedi exploration and colonization vessel sent to far-off reaches of the cosmos to identify potential Force-users and hunt down a lost knight, Jedi Master Jorus C'baoth struggles with an inappropriate lust for power. Thrawn's attack on the ship (secretly influenced by Darth Sidious's agents) insures his own eventual exile from his race and sets other sinister wheels in motion. As these old and new characters wrestle with difficult moral questions, Zahn deftly portrays their inner struggles in fluid prose, while also affirming his status as a skillful creator of dazzling futuristic worlds. Though more time with the doomed Outbound Flight's passengers, who are the subject of Survivor's Quest, would round out the story, the book is nonetheless an enthralling page-turner sure to appeal to its target audience.